I wondered, 'Will a Yahoo chess story turn up in December?' As the month continued, there were at least three stories grabbing headlines. ...which might as well have been a monthly recurring question, i.e. 'Will a Yahoo chess story turn up next month?' Indeed one did, although I had to wait until the last week of January. In 1987, Russian grandmasters Anatoly Karpov and Garry Kasparov faced off in Seville, Spain for the World Chess Championship. David Llada, then a nine-year-old boy growing up the small northern town of Asturias, remembers being captivated by a newspaper photograph of the two chess geniuses. After passing through a stub page in sports.yahoo.com, the corresponding link eventually went to The Tortured Deep-Focus Faces of Tournament Chess Players (wired.com), a slideshow of 12 photos from David Llada's recent book The Thinkers. Chess players know that they make interesting photo subjects, and it's about time that the non-chess press agrees. Unfortunately, the associated Wired.com article failed in its basic journalistic duty of spelling Llada's name correctly. The first few mentions of his name used the spelling 'Lloda'. While most of these have since been corrected, the sloppiness has been preserved for posterity in The Tortured Face of an International Tournament Chess Photographer (xpertchesslessons.wordpress.com). Imagine a world where journalists not only show the fascinating side of chess players, but actually spell their names correctly! For another example of a book devoted to chess photography, see Black and White Passion (February 2016) on this blog. The photos in that book were taken by Catherine Jaeg. The second of the 'January Yahoos' shown above was an ad, 'Curious How Your Net Worth Stacks Up? ', illustrated by a set of chess pieces. While not as interesting as most of the chess ads I once collected for Chess Ads V (August 2009), it's still good to see. Despite the increasing popularity of photos as collectors' items, we don't often see them here on Top eBay Chess Items by Price. While an individual photo might be expensive compared to other photos, it isn't when compared to other categories, like artwork. Take, for example, the last photo featured in this series, Man Ray Chess Photos (September 2017), which I used because 'the short list had only a single item and I had to go well under my usual cutoff price to find it.' How many other unique photos are lurkng just outside the price radar? The following image shows the highest priced items returned by eBay on a search for 'chess photos'. The highest priced item -- 'CUSTOM PET PORTRAIT pencil drawing from your favorite photo by Carlene Chess' -- isn't a chess item, but the rest are. Albumen Photograph of Café De La Régence. Paris: [circa 1890]. Two albumen photographs adhesive mounted on opposite sides of a stiff card album leaf. Photos measure 8 3/8” x 10 7/8” on a leaf measuring 14” x 10¾. Photos very good or better with some fading, mostly at extremities. An outstanding photograph of the Café De La Régence, the storied cafe that originally opened in 1681 and was located at 161 Rue Saint-Honoré when this photo was taken. It was considered a center of European Chess with numerous masters playing there as well as a haven for intellectuals -- Marx and Engels met for the first time at the cafe in 1844. This photo shows well dressed men and women sitting at outside tables while two waiters tend to them. Matching wits with a roomful of opponents at once, Bobby Fischer, the United States chess champion, studied a move at the Pfister Hotel, Thursday night. Fischer played 55 opponents, moving continuously around the inside of a large rectangle. He defeated 47 foes, drew five and lost to three. The description also said, 'Photo measures 9.75 x 8 inches. Photo is dated 05-15-1984', repeating the error in the item's title. That should be '1964'. The other items in the composite image did not fetch higher prices for being photos. Several sold for their autographs. The last item was titled 'RARE Chess Memoirs: Chess Career Physician Lasker Pupil Joseph Platz SIGNED' and sold 'Best offer accepted' for less than the asking price. Rare limited print copy of "Chess Memoirs: The Chess Career of a Physician and Lasker Pupil" by Joseph Platz written in memory of his dear friend and teacher "The Greatest of them all" Dr. Emmanuel Lasker. 1979. This copy is signed and dedicated by Dr. Joseph Platz to "William Lombardy" who wrote his ExLibris on the back of the cover page. I imagine it came from the same collection as Lombardy's MCO (October 2017). 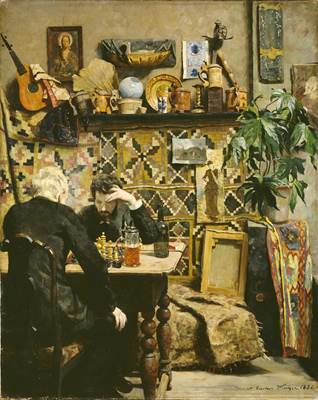 Gustav Wentzel - Chess Players (1886) © Flickr user Gandalf's Gallery under Creative Commons. Gustav Wentzel (1859 - 1927) was a Norwegian painter. He was best known for interiors and domestic and rural scenes. His artistic style was associated with Naturalism and noted for accurate observations and attention to detail. For a previous post inspired by the same Flickr user, see Isidor Kaufmann (May 2011). 9.6. Marketing Committee  Annex 72 is Minutes from the Marketing Working Session. It was proposed to establish a new membership for Marketing Committee. It consists of the following: Chairman: Martin Huba, Secretary: Kraytem Ezzat [...] The General Assembly approved the new membership of Marketing Committee. Like many marketing materials, Annex 72 is high-level and vague, e.g. The need to define a strategy in communication and especially in social media was agreed by Messrs. Freeman, Borg and all the participants and some concrete proposals are expected to be submitted to the FIDE management in the next future. Mr. Herbert thanked the Treasurer for raising the budgets of Commissions. He asked [whether] the budget for Marketing Committee exists or not. Prof. Siegel replied that there was a meeting with Mr. Huba who said he has some projects and he needs money for them. So he provided a list of expenses and there is a monthly salary of 3,000 euro and an annual travel of 24,000 euro. This is unacceptable as he was reluctant with other Commissions, in particular in a Commission which just starts. Mr. Huba said he cannot do anything if he does not get anything. The money proposed by the Treasurer, was 10,000 euro. We cannot give a salary of 3,000 euro to the Chairman of a new Commission which did not produce anything. Mr. Borg said in Baku we did not have a quorum to establish the Commission. It is not intended to bring sponsorship, as there is a different mechanism for this. In this case the brief of this Committee to try to understand what is the vision of FIDE. It has an advisory role. He said no money for Marketing is not correct. I would agree with 10,000 euro to be included. He said he would speak to Mr. Huba. 4.20. Marketing Committee.  Annex 38 is Committee’s Minutes. Executive Board noted. For example, that last bullet says, 'Present number of about 130,000 FIDE rated players could be raised easily to few millions but there is a need of a sensitive and focused negotiations with individual federations'. The rest of the annex is a marketing presentation titled 'Chess Means Smart' with 16 slides of photos under headings like 'Chess Is History' and 'Chess Is Culture'. The following section has 16 pages titled 'FIDE Situational Evaluation', where the first slide serves as a table of contents. I've copied it here. 2) Permanent Youtube channel, Facebook, Twitter, photo & results site, press kits. The current membership of the group is on the FIDE Directory: Marketing Committee (fide.com). Feeling under the weather? Looking for an easy subject that doesn't require any deep thought? That's me today, so I was happy to find the results of the latest poll by the Association of Chess Professionals (ACP). Our Tournament of the Year 2017 poll, which this year has been anticipated to the earliest part of the year in order to make it even more relevant, saw quite a few tight races for the best tournament in several categories. After listing top tournaments in specific categories like 'Round-Robin' and 'Official [FIDE] Events', the ACP gave combined results. The Overall Best category, perhaps the most important one, saw our members’ preference for open tournaments. First was the Tradewise Gibraltar and second was Chess.com Isle of Man International. Third and fourth were the preferred Round-Robins Sinquefield Cup and Tata Steel Chess, with a rather peculiar swap in places between these two excellent events. Here are the top-10 tournaments in the combined category. Three 2017 Gand Prix events were among the four lowest ranked tournaments overall. Is the ACP trying to tell FIDE something? For the previous ACP survey on this blog, see ACP Survey 2016 - Results (April 2016). We started this series of instructional videos with the current World Champion, GM Carlsen, then worked through each of the eight candidates for a title match later this year: Anand, Aronian, Caruana, Giri, Karjakin, Nakamura, Svidler, and Topalov. In 2016, I featured instructional videos showing each player analyzing a game. This time I'll feature each player being interviewed after a game. The eight players, in alphabetical order, are GMs Aronian (*), Caruana (*), Ding Liren, Grischuk, Karjakin (*), Kramnik, Mamedyarov, and Wesley So. Players with an asterisk ('*') after their names also played in the 2016 Candidates. Let's start with the first player in the list, the ever-popular GM Aronian, who is certainly one of the favorites to win the event. Aronian had just won the 2017 Tbilisi World Cup, where he and his final opponent, Ding Liren, both qualified into the 2018 Candidates. As for the series on chess engines, I started with a look at the most important components. Then I looked at TCEC Season 10, which was entering its final weeks. As that last item hints, a powerful newcomer, AlphaZero, appeared during the last days of the TCEC, and I spent some time to review its underlying technology. I'll come back to the subject for TCEC Season 11, which is currently underway, and for a deeper look at AlphaZero. New to Game Quitters and need to learn the basics of how to quit playing video games? What should you do if you're bored? What about all of your friends? I've never been a keen video game player, but I know that online chess can be addictive. What do non-chess gamers think? At 3:30 into the video, the speaker [Cam Adair] says, 'Chess is OK. Online chess not so much. In person it's awesome. You have to be super careful that you're not using these things as an escape, for instant gratification.' Next question: How to give up chess blogging? Last November, when I posted about Multi-dimensional Chess Imagery ('For more about New York City's Chess Forum, see chessforum.com: "Your Gateway to the World of Chess". '), and A Democratic Game ('By one of those coincidences that can't be explained, Chess Forum was featured on this blog a week or so ago. '), little did I know that I was viewing the aftermath of 'The Civil War on Thompson Street'. A New York small business owner had to fight for his chess shop’s life when he went to war with the competition. The battle was a little too close for comfort. That’s because his rival and former colleague was right across the street. Meet Imad Khachan of the Chess Forum. He has a story to tell. It might be worth looking at 'Top EBTH Chess Items'. Let Us Do The Heavy Lifting. Whether you have an entire collection or just a few items, EBTH makes downsizing profitable. A search on 'chess' returns more than 1700 items, which can be sorted in different ways. The composite image below shows the top items in four important sort orders. 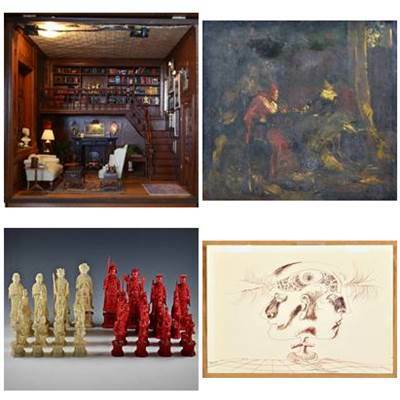 Most Followed (upper left)  2017-12-27: Vintage Miniature Library Room From The Charles Tebelman Collection; Final Bid $705; 46 Bids  A chess set is behind the chair in the center. The second item in the sort was another miniature. Bid Amount - high to low (upper right)  2015-10-05: Frank Duveneck Original "The Chess Players" Oil Painting; Final Bid $5699; 111 Bids  The painting needs cleaning. I tried to brighten it digitally, without much success. Most Bids (lower left)  2013-04-02: Antique ivory chess set; Final Bid $3028; 128 Bids  The keyword here isn't 'chess', it's 'ivory'. A Google search told me the company EBTH Inc. was founded 2008. With 1700 items over ten years, we should see a new item related to chess every couple of days. After taking the time to download and prepare the FIDE Rating List - January 2018, what can be learned from the data? The left side of the chart below shows numbers similar to last year's post The Lower Rating Band (January 2017), which compared numbers of rated players by federation in 2016 and 2017. The table on the bottom left is particularly noteworthy, not only because of the two new federations, but because of the disappearance of Bulgaria. What happened to the more than 1550 Bulgarian players shown in 2017? They have been subsumed into the 'FID' (FIDE) numbers shown in the table on the top left. For more about the reasons behind this, see last week's post on the FIDE's Ethics Commission 2017. The table on the right is a new analysis I created after calculating the numbers of inactive players in the 'FRL January 2018' post. It shows the percentage of active players in 2018 for federations having 100 players or more. I chose the number 100 to demonstrate that small and medium size federations can have an impact on the growth of interest in chess. The top two federations are both countries in Africa. A few days after writing last week's post, The Lineage of AlphaZero, I was looking to relax in front of the TV by watching Netflix, but what to watch? I started by browsing a list of recommended titles (or 'popular now' or something like that) and one of the first to appear was a documentary about AlphaZero's predecessor AlphaGo. Was that a coincidence or are the search engines also following me on TV? Whatever the reason, here's a Youtube trailer for the film. AlphaGo chronicles a journey from the halls of Cambridge, through the backstreets of Bordeaux, past the coding terminals of DeepMind, to Seoul, where a legendary Go master faces an unproven AI challenger. As the drama unfolds, questions emerge: What can artificial intelligence reveal about a 3000-year-old game? What will it teach us about humanity? The documentary had only two stars out of five on Netflix, perhaps because it's at times somewhat tedious. The trailer shows many of the most exciting moments, but the full film was still worth watching. The 'legendary Go master' is Lee Sedol (or 'Se-dol Lee' as his name is sometimes written and which looks more Korean). The film reminded me of the chess documentary Game Over: Kasparov and the Machine by Vikram Jayanti, which chronicled Garry Kasparov's 1997 loss to IBM's Deep Blue. Many years ago on this blog, I featured the trailer for that film in A Milestone in Computer Chess History (May 2007). When I was still in school, I learned how to play Go and played a few games with a friend. I understand a little about the game, but only a little. Extrapolating from my own experience with Go, I can easily imagine how casual players of chess react to the chess documentary. Since this a 'Chess' blog, not a 'Go' blog (unlike the word 'chess', the word 'go' has to be capitalized to distinguish the game), this is probably the last I have to say about the subject. Future time would be better spent understanding the technologies that drive the AlphaZero family. Just like most years, the choices for Top eBay Chess Items by Price dwindled at the start of the new year, after the frenzy of the yearend holiday season. The painting below, titled '19C Signed V. Landoza Oil Painting of a Chess Game Figural Parlor Scene', sold for US $415.05 after 22 bids from 11 bidders. The painting might also be titled 'What's on a man's mind? 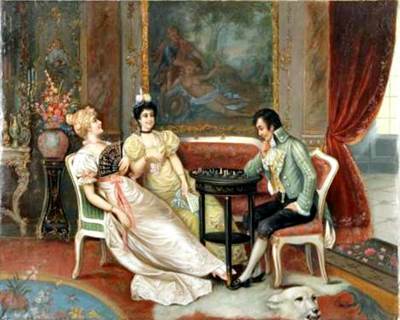 ', not so much for the chess as for the second painting behind the players, perfectly positioned between two of them. Was this the 19th century equivalent of a balloon in a comic? While looking for more about artist Landoza, I discovered that the same(?) painting had sold twice in 2017 on Ebth.com: in March for $1550 and in December for $326. For an earlier example of this phenomenon, see a previous 'Top eBay Chess Items' post, From EBTH to EBAY (July 2017). NB: It might be worth looking at 'Top Ebth Chess Items'. When I first saw this photo, it had zero views and zero faves. After I looked at it, it had one view and one fave. Human-size chess game with actual soldier in St. Petersburg, Russia (1924) © Flickr user DailyLolPics.com under Creative Commons. 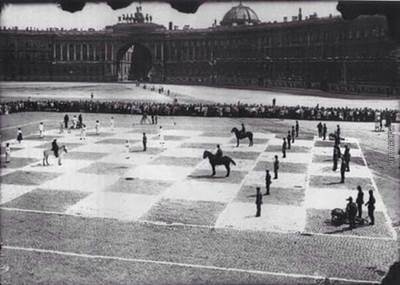 The post Human-size chess game with actual soldier in St. Petersburg, Russia (1924) appeared first on Dailylolpics. Pawn: Sire! The opposing forces have broken through our defenses! King: What? How? We built an impenetrable wall! Pawn: A horse jumped over our castle and landed on one of the priests. King: Blast! I should have known. Have our infantry rush into enemy territory. Any who survive will become exact replicas of my wife! One of our cases was ground-breaking in the area of anti-cheating measures and for the first time we relied on Prof. [Kenneth] Regan’s calculations and his statistical method. He has to be thanked for his analysis to give us evidence for cheating. There was not enough behavioural evidence. He referred to the past debate with Deputy President [Makropoulos] whether there will be instances when only a computer evidence will be enough to convict someone. Case 5/2016: Complaint by FIDE General Assembly regarding alleged fictitious transactions between the European Chess Union (ECU) and the Bulgarian Chess Federation (BCF) during 2011-2014 and the use of an imposter corporation named European Chess Union LLC -- whether BCF and/or any individual implicated -- Matter still in investigatory phase -- If prima facie case of wrongdoing against identified bodies or persons is found to exist, matter will proceed as a disciplinary proceeding for violation of FIDE Code of Ethics. What we are talking about is two categories of potential wrong-doers. The case of million of euros diverted to a false bank account. He said we identified these individuals and we are ready to proceed against them. They are the main culprits. The issue raised by Mr. Makropoulos is about the rest of the Bulgarian Board which turned a blind eye. In a related action, among the Executive Board 2017 Decisions (fide.com) were 'To temporarily exclude the Bulgarian Chess Federation', and 'To approve that the players from Bulgaria to play under FIDE flag'. Specfic consequences of the decisions were announced a few days later in Bulgarian Players, Arbiters and Trainers (fide.com). Anton Kovalyov today forfeited his game with Maxim Rodshtein in round three of the FIDE World Cup in Tbilisi, after being asked to change his attire. Upset about how he was treated, the 25-year-old Canadian grandmaster decided to leave the tournament immediately. [...] Ten minutes before the start of the round, Anton Kovalyov was approached in the playing hall by Chief Arbiter Tomasz Delega. The arbiter asked the player if it was possible to wear long trousers, instead of the shorts he was wearing, as this wasn't complying with the tournament's dress code. [...] Then Kovalyov was approached by chief organizer Zurab Azmaiparashvili, who told him that he should change his attire. When Kovalyov asked why, Azmaiparashvili replied: "Because you look like a gypsy!" This statement is released on occasion of the meeting of the FIDE Ethics Commission (EC) in Antalya, Turkey on 9 October 2017. Its purpose is to make known the EC’s decision in case no. 2/2017 and the reasons for the decision in the light of the wide-spread interest in the matter. [...] On 27 September 2017 the EC received a formal complaint against the organiser of alleged breaches of the FIDE Code of Ethics from the Chess Federation of Canada (CFC). The CFC asserted that it was acting "in and for itself and on behalf of GM Anton Kovalyov". The complaint was not supported by any statement by the player. [...] Without authority from the player, it is not possible for his federation to proceed with the complaint on his behalf. Also, the standing of the CFC to act as the complainant in its own capacity, is dubious. It is required that a complainant must have a direct and personal interest which was adversely affected. Case no.2/2017 is now marked 'Case rejected'. This might be the fastest decision ever made by the Ethics Commission. In my next post, I'll look at which federations are included, like I did for the 'Lower Rating Band' post. Getting back to business after the yearend holidays, let's continue looking at the underpinnings of AlphaZero. In the previous post, The Constellation of AlphaZero (December 2017), I enumerated the underlying technologies. AlphaZero wasn't created by 'a bolt from the blue'; it was the latest evolution in a line of game playing algorithms -- Giraffe, AlphaGo, AlphaGo Zero, AlphaZero -- stretching back a few years. Each of those evolutions was introduced in a separate paper from which I give the abstracts. This report presents Giraffe, a chess engine that uses self-play to discover all its domain-speci c knowledge, with minimal hand-crafted knowledge given by the programmer. Unlike previous attempts using machine learning only to perform parameter tuning on hand-crafted evaluation functions, Giraffe's learning system also performs automatic feature extraction and pattern recognition. The trained evaluation function performs comparably to the evaluation functions of state-of-the-art chess engines - all of which contain thousands of lines of carefully hand-crafted pattern recognizers, tuned over many years by both computer chess experts and human chess masters. Giraffe is the most successful attempt thus far at using end-to-end machine learning to play chess. A long-standing goal of artificial intelligence is an algorithm that learns, tabula rasa, superhuman proficiency in challenging domains. Recently, AlphaGo became the first program to defeat a world champion in the game of Go. The tree search in AlphaGo evaluated positions and selected moves using deep neural networks. These neural networks were trained by supervised learning from human expert moves, and by reinforcement learning from selfplay. Here, we introduce an algorithm based solely on reinforcement learning, without human data, guidance, or domain knowledge beyond game rules. AlphaGo becomes its own teacher: a neural network is trained to predict AlphaGo’s own move selections and also the winner of AlphaGo’s games. This neural network improves the strength of tree search, resulting in higher quality move selection and stronger self-play in the next iteration. Starting tabula rasa, our new program AlphaGo Zero achieved superhuman performance, winning 100-0 against the previously published, champion-defeating AlphaGo. The game of chess is the most widely-studied domain in the history of artificial intelligence. The strongest programs are based on a combination of sophisticated search techniques, domain-specific adaptations, and handcrafted evaluation functions that have been refined by human experts over several decades. In contrast, the AlphaGo Zero program recently achieved superhuman performance in the game of Go, by tabula rasa reinforcement learning from games of self-play. In this paper, we generalise this approach into a single AlphaZero algorithm that can achieve, tabula rasa, superhuman performance in many challenging domains. Starting from random play, and given no domain knowledge except the game rules, AlphaZero achieved within 24 hours a superhuman level of play in the games of chess and shogi (Japanese chess) as well as Go, and convincingly defeated a world-champion program in each case. To understand AlphaZero, it helps to understand AlphaGo Zero. Here is a useful video explaining some of the fundamental concepts. There's been way too many fear-mongering news articles around the latest version of DeepMind's AlphaGo. Let's set the record straight, AlphaGo is an incredible technology and it's not terrifying at all. I'll go over the technical details of how AlphaGo really works; a mixture of deep learning and reinforcement learning. 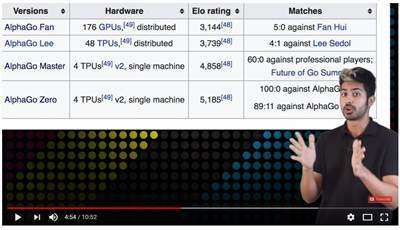 At one point, the presenter Siraj Raval shows an overview of the different AlphaGo evolutions. Now that I have some understanding of the concepts behind AlphaZero, I can look a little deeper into those technologies. Almost every time I assemble a short list for Video Friday (last seen in Chess News Hat Trick), there is at least one clip from YouTube's channel for ChessBase India (CBI), but the final selection for the post is always from another channel. Let's sneak one CBI clip into this next post for the series on The Sociology of Chess (November 2016). But which one? I thought about featuring How much money would you take to quit chess forever? or Praggnanandhaa vs Firouzja: Clash of two future World Champions, but went instead with a video explaining corporate sponsorship. For many reasons, this is one of the weakest areas of chess in general. Yatin Shah is the co-founder and executive director of IIFLW. He visited the 3rd Mumbai International tournament and spoke to ChessBase India about the event. In chess, where corporates think twice before supporting the sport, IIFL is backing the sport in a big way. Here's what Yatin has to say. IIFL (formerly known as India Infoline Limited), is an Indian diversified financial services company headquartered in Mumbai. [...] IIFL is ranked among the top seven financial conglomerates in India and as the top independent financial services firm in India in terms of market capitalisation. In response to the question 'Why is IIFLW supporting chess in such a big way? ', Yatin Shah says, 'Chess is a great sport' and 'Viswanathan Anand has a great fan following in India and kids are really inspired by him'. The main CBI site is at ChessBase India. In the previous edition of Video Friday, Dirty Mind Games, I asked, 'How often does chess grab mainstream headlines twice in one month for different stories?' Strike that question and replace it with 'three times in one month' (or 'thrice in one month' if you like archaic terms). The news clip is from the Youtube channel, 'Euronews (in English)', and their related story is Chess tournament controversy (euronews.com; 27 December 2017). In the chess world a storm is brewing. Saudi Arabia has effectively banned Israel in participating in the World Chess Championship. The Israeli team were denied visas to enter the country. Saudi Arabia says this is because they have no diplomatic ties with the state of Israel. For an overview of all three stories at the same time -- and proof that they made mainstream news -- see last month's post on this blog, December Yahoos. The six page 'Proposal for 43rd Chess Olympiad (Batumi 2018)' included a one page 'Executive Summary'. The report to the Congress ended 'with a very respectful but loud cry for financial support'. Does FIDE leadership realize that if FIDE doesn't manage to keep chess engines out of its human competitions, the decline of international, organized chess will surely follow? 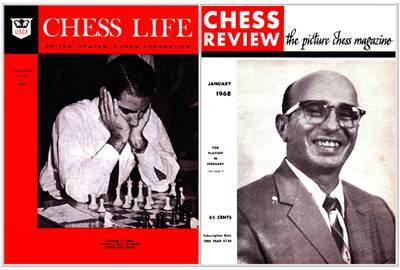 Fifty years ago the two major American chess publications entered a new year with stories from the old year. [American Open] Details next month. In last month's December 1967 'On the Cover', the CL cover showed a list of 'Interzonal Qualifiers' with the promise, 'A full report follows soon.' There was nothing about that tournament in the January 1968 issue, meaning that CL now had a two month backlog of promises. Samuel Reshevsky is in for a playoff with Vlastimil Hort of Czechoslovakia and Leonid Stein of the Soviet Union at Los Angeles in February. The winner joins the five already qualified from the Interzonal Tournament at Sousse in 1967: Bent Larsen of Denmark, Svetozar Gligoric of Yugoslavia, Yefim Geller and Viktor Korchnoi of the Soviet Union and Lajos Portisch of Hungary, plus Boris Spassky and Mikhail Tal of the Soviet Union seeded on their results in the previous Challengers Round of matches. These eight are scheduled for match play later this year to determine who is to be the Challenger in 1969 to take on World Champion Tigran Petrosian of the Soviet Union. The Fischer Fable  The incidents involving Robert J. Fischer at the Sousse Interzonal seem to be building into a fable. We hear rumors and see articles, or parts of them at least, in other publications which are erroneous. One such story is that he had lost adjournments pending when he withdrew. He had completed ten games for an 8 1/2 - 1 1/2 score, had some postponements, but not a single adjourned game pending and, on his account, he did not withdraw. On hard facts, however, we have no more information now than that given in our December issue [a full page article with crosstable]. The event germinated as follows: The writer had long urged that whenever International Grandmaster tournaments are held in this hemisphere, the participants be invited to every major U.S. chess center to give exhibitions, talk to the local fans, and, if possible, compete in events giving U.S. masters a rare chance at international experience and qualifications for FIDE titles. As the Winnipeg tournament approached, he pointed out to several organizers in the Los Angeles area that here was the opportunity to advance the cause of chess. Consequently, three local clubs agreed to invite IGM Gheorghiu of Rumania for exhibitions. Florin Gheorghiu is the nervous type, and will ask almost anyone, "Is my pawn sacrifice correct" or "Shouldn't I win?" but before you have a chance to answer, he has already accepted a draw! He was to go to Los Angeles for three exhibitions arranged by Anthony Saidy, but could not obtain a visa. It would indeed appear that A.Fortuna and A.Saidy were the same person. Why the coyness?